Born in San Pedro Tlaquepaque on July 27 of 1847 and died on August 8 1909. Pantaleón Panduro started his adult life working at a brick factory. There he learned about the properties of clay and soon was able to master them. He was not happy with his life though, since his hard work would barely bring enough money home to support his wife and seven children. One day he started modeling in clay. He made busts of the people he worked with and they were very impressed when they got to see the finished piece. The quality of his craftsmanship brought people from all walks of life to look for him and ask him to make their "Retratos" (Portraits) Pantaleón would readily acknowledge and in no more than 30 minutes he would make a life-like clay figure that resembled the person so much that he earned the name of "El Brujo" (The Wizard). He made Retratos of many celebrities including politicians, bullfighters, police officers, circus people and the wealthy ranchers who were amazed at the quality of his work. When he died, Pantaleon left his legacy and life's work to his children. Raymundo, his 5th son, experimented with equestrian themes which are of great value today. 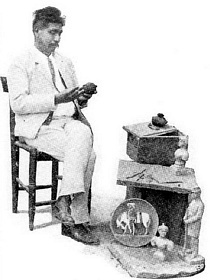 Raymundo´s sons Juan and Honorato also dedicated their lives to the craft of clay sculpting. Some of their subjects include Jackie and John F. Kennedy, Lyndon Johnson, Queen Elizabeth and many Mexican Presidents.